I’ve read it in writing magazines and on blogs and websites of famous writers that going to writer’s conference is one of the best things you can do if you are serious about being a writer. Writing conferences are part education, part encouragement, and part filler of that elusive creative well. If you’ve been to Jot, I hope you’ve experienced these things. Writing can be a lonely process. This is not just true for us amateurs but for professionals too. In the book CS Lewis: Eccentric Genius. Reluctant Prophet., Alister McGrath points out that Tolkien (older and well respected in higher education circles of his day) timidly showed CS Lewis one of his poems he had been working on. Lewis approved of it so enthusiastically, he showed him more. In part, because of that encouragement we now have The Hobbit and the Lord of the Rings. Being around other writers is essential to our success. 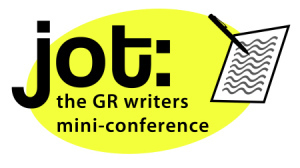 So, how do you get the most out of a writer’s conference that lasts for only one night? Pull a bit of your hidden world out of your pocket, be bold and share. Ask the presenters questions. Take notes and attend Matthew Landrum’s Poetry workshop (limited spaces available) even if you are not a poet. Get to know the person next to you, and share a little bit about your work. You may find a kindred spirit, and even if they are a poet and you are writing a memoir, you will find a friend and also affirm aloud what you are: A WRITER. Every time I leave a writers conference I am buzzing with so much energy I cannot sleep. If that is you, use that energy to write when you get home. Don’t miss out on this great event. Come ready to learn. Come ready to meet other writers, and come with you notebook or laptop and commit to getting some words down on the page. The Weaklings thank you in advance for coming out for this free event. If you have questions about the event, please post them below. We’ll try our best to get them answered before tonight. Or, write them down and bring them with you. If you cannot attend, I’ll be live tweeting the event. You can follow me @parttimenovel. We may also have a live stream up and if so, I’ll tweet or post the link here on the blog.